With an elegant red-and-gold theme befitting of its name, Empress Room offers guests the chance to dine like Chinese royalty. The rotating seasonal menu features a variety of favourite Cantonese dishes incorporating fresh local ingredients. 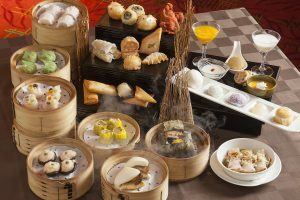 Our famous dim sum lunch buffet is not to be missed. For dinner, our chef’s signature double-boiled soups are the perfect way to warm up on a chilly evening, and seafood lovers are spoiled for choice with a variety of fresh-caught specialties. Four private rooms are available for memorable family celebrations and discreet business dinners. Leow Leong Hock was an award-winning chef with rich experience in Singapore before coming to Japan. He was awarded Top Five Most Popular Restaurant from 2002 to 2004, and was the winner of “The Best Seafood Dish” in Singapore Gourmet Hunt 2002. He has presided over the kitchen of the Empress Room for ten years. Chef Hock loves going to local markets to look for the freshest seasonal ingredients. He is interested in the health benefits Cantonese ingredients can offer, particularly Chinese herbs, which he relies on to create his signature dishes of double-boiled chicken soup with Korean ginseng and red dates and braised cod fish fillet with angelica.